Liczba stron: 136 Jest to ujednolicona liczba stron, która ułatwi Ci porównanie długości książek. Każda strona Legimi to 200 słów. Labradoodle and Labradoodles, from Labradoodle Puppies, the Mini Labradoodle, the standard Labradoodle, the Australian Labradoodle, this is the definitive Labradoodle source! As a true Labradoodle lover the author enjoys covering everything from finding a Labradoodle Breeder to Labradoodle Puppies for Sale, Care, Labradoodle Training, Health & More! Labradoodle and Labradoodles is everything you need to know about Labradoodles - from Labradoodle Puppies, the Mini Labradoodle, the Australian Labradoodle - this is your definitive Labradoodle resource. Covers Labradoodles, Labradoodle Puppies, Labradoodle Rescue & Adoption, finding a Labradoodle Breeder, selecting and raising your Labradoodle. How to avoid the most common mistakes with Labradoodles. How not to pay too much and to find a reputable Labradoodle Breeder. Toy Labradoodles and the Mini Labradoodle, vs the Standard Labradoodle and the Australian Labradoodle- and how to tell them all apart! Discover which Labradoodle is really right for you. Another informative and entertaining title from passionate dog owner & Labradoodle lover Susanne Saben! As a Labradoodle lover- Susanne enjoys advising on all aspects of Labradoodle care from Labradoodle Care to Labradoodle Grooming, Labradoodle Medical Care & Health, and Labradoodle Training.Ensuring you have a healthy and happy Labradoodle is rewarding and well worth it! Whether you are considering a Labradoodle for the first time, or you're a seasoned Labradoodle owner, the tricks and tips within this guide will prove invaluable. 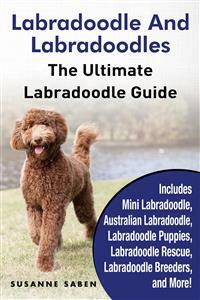 This book is a must-have guide for anyone passionate about Labradoodles. Whether it's Labradoodle Puppies for Sale, the Mini Labradoodle, the standard Labradoodle, the Australian Labradoodle, Labradoodle Prices, Labradoodle Breeders- or anything in between- the author lays out everything you need to know - and common mistakes to avoid! The book is written in an easy to read and understandable style. In a straight forward, no nonsense fashion, Susanne Saben covers all aspects of deciding on, adopting or buying a Labradoodle and ensuring you raise and experience a healthy and happy Labradoodle throughout its life. Includes Mini Labradoodle, Australian Labradoodle, Labradoodle Puppies, Labradoodle Rescue, Labradoodle Breeders, and More! What do you get when you cross a beautiful Poodle with a lively Labrador Retriever? The best dog breed imaginable, of course, The Labradoodle. The Labradoodle is beautiful breed known for its curly coat and friendly personality. These dogs are the definition of “man’s best friend” and I am personally lucky enough to own two of them! I have enjoyed the company of my Labradoodles so much that I just had to share my experience in the hopes of helping potential dog owners like you become more familiar with this amazing breed. The Labradoodle is by far one of my favorite dog breeds and in reading this book, I hope that you will come to see why. I also hope that you might be inspired to bring home a Labradoodle puppy for yourself or your family! These dogs are absolutely gorgeous and full of life and personality, so they make excellent family pets. But don’t just take my word for it – keep reading to learn everything you need to know about Labradoodles and to decide whether they just might be the perfect pet that you and your family have been looking for! 1.) What is a Labradoodle Dog? 2.) Do Labradoodles Get Along with Other Pets? 3.) How Many Labradoodles Should You Get? Cute and fluffy, the Labradoodle is known just as much for its beautiful wavy coat as for its friendly personality. When it comes to choosing a dog breed, many people become overwhelmed by the sheer volume of options available to them. Do you go with a breed known for its friendly personality and gentle temperament or do you pick one that is known for its intelligence or for its beautiful coat and color? If you find yourself asking these very same questions, you may be glad to know that there is a single breed that contains all of these wonderful qualities. Which breed am I talking about? The Labradoodle! The Labradoodle is a designer dog that comes from a crossing of a Labrador Retriever and a Poodle – does the name make sense now? I can tell you from personal experience that the Labradoodle possesses some of the best qualities of each parent breed and that this dog breed is entirely unique from all others. I should know because I have two of my own! I brought home my first Labradoodle puppy nearly six years ago now, and I immediately loved him so much that I had to get another! Having been a proud Labradoodle owner for more than half a decade, it is fair to say that I know a lot about this breed. Designer dogs can be tricky sometimes since they are a cross between two pure breeds, but I happen to like surprises! From the moment I brought home each of my little bundles of love, I was enamored with the breed, and I wanted nothing more than to share my love with the world. That is where this book comes in! It is my goal and my sincere hope to help spread the word about the Labradoodle breed and to bring other dog owners like you into the fold. I am absolutely certain that once you learn about the many things, there are to love for the Labradoodle breed that you will become a believer yourself! So, if you are ready to learn more about the Labradoodle breed and what makes it such a wonderful pet, then I encourage you to turn the page and keep reading. Let’s get to it! Designer Dog – A dog breed created by crossing two pure breeds. Because the Labradoodle is a cross between the Poodle and the Labrador Retriever it has a very gentle temperament. Knowing that the Labradoodle is a combination of the Labrador Retriever and Poodle breeds is not enough to truly understand this breed. Each and every dog is unique in terms of Labradoodle temperament and personality, but learning about the parent breeds will help you to understand your dog a little better. In this chapter, I will introduce you to the Labradoodle breed and provide helpful information about the parent breeds as well. You will also receive a history of the breed and an overview of different Labradoodle types and colors! You don’t have to own a Labradoodle yourself in order to know what one is. These dogs are incredibly popular and for good reason! They are cute, cuddly, and absolutely full of life – you’ll just have to take my word for it until you get your own. I also want to remind you that because the Labradoodle is a mixed breed dog, each one is completely unique. Dog genetics are relatively complicated so you can’t expect a Labradoodle to possess all of the best traits from each parent every time. What I would recommend to you, if you want to learn more about what the Labradoodle is like, is to learn a little more about the two parent breeds – the Labrador Retriever and the Poodle. That is what you will find in this section! The Labrador Retriever is consistently ranked as the most popular pure breed in the United States according to American Kennel Club (AKC) registration statistics each year. This breed is known for its friendly and fun-loving personality, but these dogs also have a bit of a mischievous side as well! Labrador Retrievers, or Labs as they are affectionately known, make excellent family pets, and they get along particularly well with children. These dogs are great companions, and they excel at dog sports too.